Low-quality reclaimed wastewater is used in irrigating crops used for feeding dairy cattle. The possibility of EDC’s accumulating in tissues and products that are then consumed by humans, means that beef and dairy products may be a source of exposure to EDC’s in humans. In this project our objective is to identify relationships between crop contamination and contamination of dairy food products (meat and milk). We have started using in vitro and in vivo animal model in order clarify the risk associated with EDCs exposure on both livestock and humans. Dorit Kalo is the PhD student conducting the experiments. Abstract: Carbamazepine (CBZ) is an anticonvulsant used mainly for the treatment of epilepsy. People treated with this drug suffer from reproductive endocrine disorders, mainly associated with CBZ metabolites. Approximately 72% of orally administered CBZ is absorbed; the other 28% passes through the body and is eliminated in the feces. The absorbed dosage undergoes enterohepatic cycling and is eventually excreted in the urine. In CBZ-treated epileptic patients, the drug affects the hypothalamic–pituitary–gonadal axis, resulting in reduced responsiveness to luteinizing hormone–releasing hormone (LH–RH), which in turn leads to lower levels of LH and progesterone. Previous studies have reported decreased fertility and teratogenic effects in children born to CBZ-treated epileptic mothers. Similar phenomena have been reported for rats. Nevertheless, it is not known whether environmentally relevant doses of CBZ or its metabolites affect human or animal fertility. 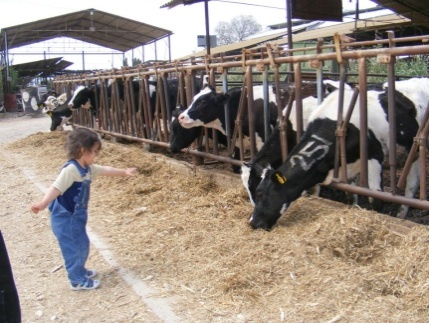 The aim of this project is to examine the effect of CBZ and its metabolites at the environmentally relevant doses, on developmental competence of bovine oocytes, using our bovine model. Study team: Prof. Zvi Roth - Principal investigator for the study. Dr. Dorit Kalo, a first-year postdoctoral fellow. Department of Animal Sciences, Faculty of Agriculture, Food and Environment. Abstract: Atrazine (ATZ) is one of the most extensively used herbicides for the control of broadleaf and grassy weeds in agricultural crops. In Israel, the use ATZ is relatively wide; about 7800 kg ATZ (active matter) are sold per year and used for 102,400 dönüm. It should be noted that although the use of ATZ in Israel is reduced in the recent years, there is no good estimation about the amounts of ATZ being used and penetrate to ground water. ATZ is considered a ubiquitous environmental contaminant, and is frequently detected in ground and surface water as a result of its mobility in the soil. Out of 17 pesticides that monitored in water sources in Israel, ATZ concentrations are the hugest and found in 16-26% of the samples. Wildlife can be directly exposed to this herbicide by eating contaminated food or water, breathing in pesticide spray or absorbing pesticides through their skin. Some trace amounts of pesticide residue can be transferred to humans via the food chain, and are potentially harmful to human health. Recently we reported that ATZ and it's metabolite diaminochlorotriazine adversely affect the spermatozoa, expressed by damaged sperm membranes). The next aim of the study is to determine whether prefertilization exposure of sperm to ATZ or DACT adversely affects the gametes' competence to undergo fertilization and successful embryonic development and to characterize the intracellular mechanism downstream of ATZ or DACT exposure. Study team: Prof. Zvi Roth – Principal investigator for this study. Alisa Komsky-Elbaz a fifth-year PhD student, second stage.